Marathas should not only be proud that Chhatrapati Shivaji Maharaj was a Maratha, but they should also acknowledge that he has had a lasting influence on the Marathi psyche, which makes their people more nationalistic and self confident than those of many other Indian states. 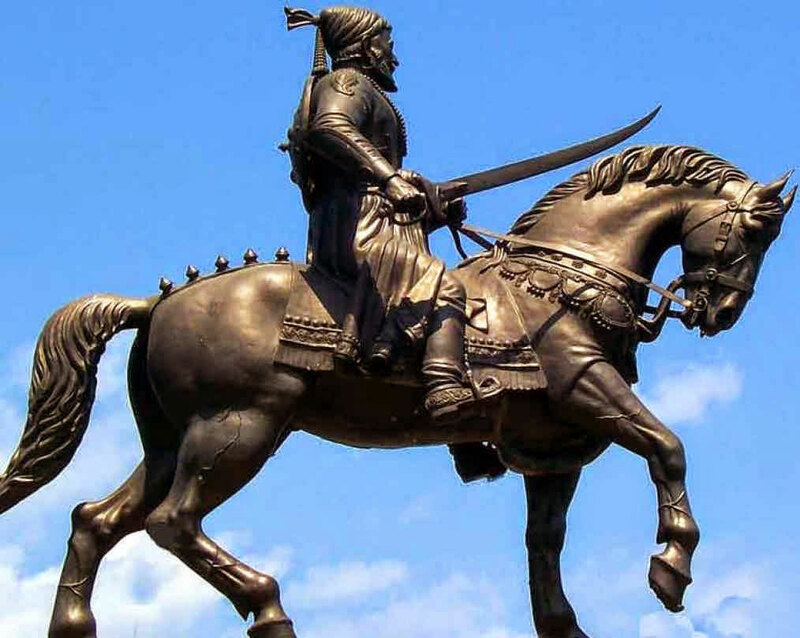 At the same time, Shivaji should be elevated to the status of a ‘national hero for modern India’, for he embodied all the qualities that are so badly needed in today’s Indian politicians: Shivaji was fearless and his courage was extraordinary. He was devoted to his own country, call it Bharat or Bhavani Bharati, or India. He was truly secular, never harming his enemies’ wives and children and though he was a devoted Hindu, he never destroyed a mosque. He was a great administrator; whatever he conquered, he saw to it that it was justly administered. He was absolutely free of corruption and cared little for his own comfort. He had great vision and wanted to unify India. Because of his sacrifice, India’s culture, spirituality and social fabric is better preserved from Mumbai to Kanyakumari. There are a few who have tried to hijack Shivaji and bind him for their own purposes. One such is Marathi writer and activist Sanjay Sonavani, who wrote a piece in Lokmat on November 19, attacking the Foundation Against Continuing Terrorism for building a shrine and a museum in Pune. First, the article is full of glaring errors: the Foundation has erected a shrine dedicated to Bhavani Bharati, not Shivaji; second, FACT is trying to build a museum of Indian history named after Shivaji and which honours him, but Shivaji’s history will only be a part of the museum. Sonavani attacks FACT on three counts: he says FACT is trying to make a god out of Shivaji; he objects to the fact that Shivaji is associated to Bharat Mata; and he says FACT is trying to link Shivaji to the Vedas. But FACT never said Shivaji was god, we only quoted Aurobindo Ghosh who wrote that he was a Vibhuti. A Vibhuti is not god but an instrument of god. Sri Aurobindo had also written that Napoleon was a Vibhuti and that he was the first one who had a vision of a unified Europe. Nobody ever protested that. Then, as far as Shivaji’s connection, or non-connection with Mother India or Bharat Mata, there are two undisputed facts: that Shivaji was extremely devoted to his own mother, who played an important influence in his life; secondly that he was as devoted to his own country, and that he wanted to rid her of her enemies. If that is not love for Mother India, then what is? That Hindus have, since time immemorial, chosen to associate their country to the feminine element is highly laudable. The Romans had done the same: Patria. I am a Frenchman brought up in the ideals of liberty, equality, fraternity and to me it is absolutely irrelevant what caste Shivaji belonged to, who his father or guru was. He was an extraordinary being. It matters not either, whether he related himself to the Vedas or any Hindu scriptures. I doubt it: he was a warrior who wanted to preserve his culture and protect his people. What is for sure is that he was a Hindu, as are a billion Hindus today, whether they are Marathas or Tamil. The theory of the Aryan invasion has been proved false by numerous recent discoveries, it has been opposed by every saint, whether Sri Aurobindo, Swami Vivekananda or Sri Sri Ravi Shankar; yet it is still used today by Christian missionaries, Marxist historians and Muslim scholars to divide India between South and North, Hindi and Dravidian, Brahmins and Shudras. Sanjay Sonavani plays into their hands. Finally, the biggest enemies of Hindus are Hindus, not Muslims or Christians. India could never have been conquered if Hindus had not betrayed Hindus. The last great Hindu empire, Vijaynagar, which was so extraordinary that its history will have pride of place in FACT’s museum, could not have been razed by Muslims if the Lingayats had not betrayed their brothers and sisters. Shivaji’s most dangerous opponent was a Hindu, Jai Singh who served Aurangzeb. It is sad that even today Hindus are so divided, undermining each other and the few supporters of their great history and spirituality. It is also a great shame that in the town of Chhatrapati Shivaji Maharaj, one cannot find a single museum worth the name to honour his memory and the spiritual and martial inheritance he left behind him. FACT only wants to remedy to that. The writer is editor-in-chief of the Paris-based La Revue de l’Inde and author of A New History of India.